Aims: The mandibular incisive nerve can be subjected to iatrogenic injury during bone graft harvesting. Using cone beam computed tomography (CBCT), this study aims to determine a safe zone for bone graft harvesting that avoids injuring this nerve. Methods: Sixty CBCT examinations of patients were included in this study. The examinations were taken using the i-CAT CBCT imaging system, applying a standardized exposure protocol. Image reconstruction from the raw data was performed using the SimPlant dental implant software. 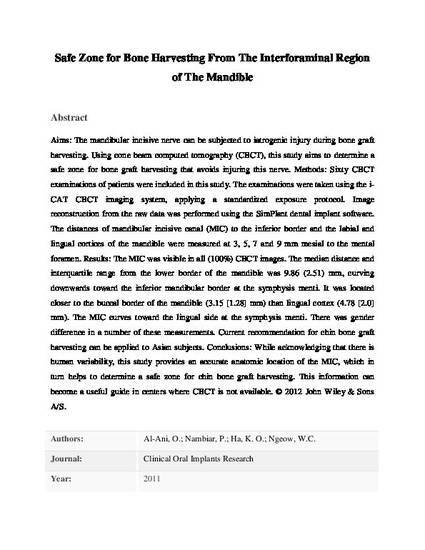 The distances of mandibular incisive canal (MIC) to the inferior border and the labial and lingual cortices of the mandible were measured at 3, 5, 7 and 9 mm mesial to the mental foramen. Results: The MIC was visible in all (100%) CBCT images. The median distance and interquartile range from the lower border of the mandible was 9.86 (2.51) mm, curving downwards toward the inferior mandibular border at the symphysis menti. It was located closer to the buccal border of the mandible (3.15 [1.28] mm) than lingual cortex (4.78 [2.0] mm). The MIC curves toward the lingual side at the symphysis menti. There was gender difference in a number of these measurements. Current recommendation for chin bone graft harvesting can be applied to Asian subjects. Conclusions: While acknowledging that there is human variability, this study provides an accurate anatomic location of the MIC, which in turn helps to determine a safe zone for chin bone graft harvesting. This information can become a useful guide in centers where CBCT is not available. © 2012 John Wiley & Sons A/S.